Hi guys! 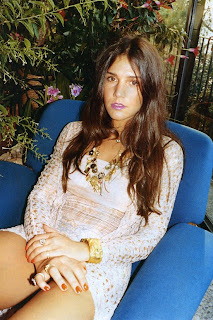 This post will be about another of my favorite style icons and muses: Margherita Missoni. Margherita Missoni is the heiress and ambassador to her family's Missoni fashion house, which was founded by her grandparents, Rosita and Ottavio Missioni. Margherita grew up in Italy and went to school in Milan and Rome and lived in Barcelona and NYC. Before she appeared in Missoni campaigns, se was the fashion house ambassador, a responsibility involving publicity at fashion related events. Missoni explained that becoming the face of Missoni as "a natural evolution." Aside from being the heiress to the Missoni empire, Margherita is also a prominent fashion "it" girl. Margherita's style is also not what is normally seen from many heiresses, even on formal events you can see the inspiration of the bohemian and hippie in Margherita. I love her style because it reflects her personality and because she's is not afraid of having fun with what she wears, I absolutely adore her way of mixing and matching prints and colors. Margherita inspires with her elegance because she decides to wear clothes that not only speak to her family's aesthetic but her own, something that is gradually becoming one and the same. Margherita is the definition of the Missioni brand. Get Margherita Missoni's style this spring!